Even if you're a Microsoft Office hater, sometimes it's extremely useful to have access to its features. Well, here's a quick way to achieve that on OS X, for free, using OnLive's Desktop service. First, you will need to download the Bluestacks application, and then register for a OnLive account on its website. Now comes the only tricky part: Bluestacks does not have a built-in browser, so you will need to open the Twitter app, and then open a link from within. 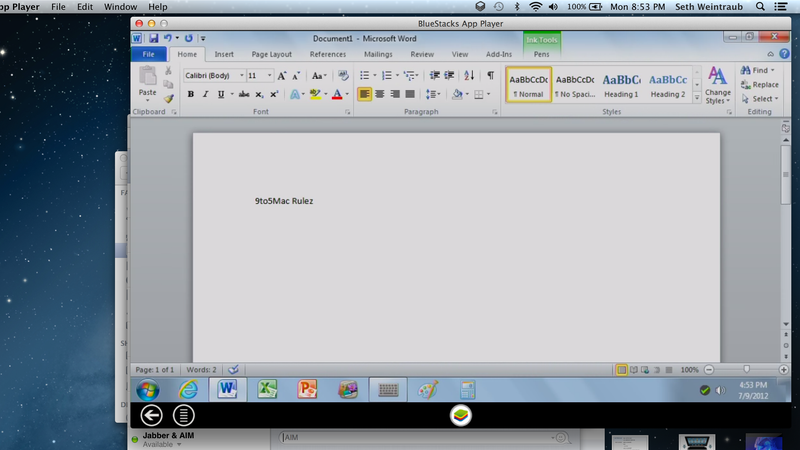 From there, Bluestack's hidden browser will launch with the link you clicked. Navigate to the XDA Forums, where you will download the OnLive Desktop .apk that installs just like a normal Android app. Sign-in to OnLive, and then you are off to the races.